Be Known for Something : Discover Your Church Communication Thread / Business Essentials / 80% of your Work is Wasted Time. I’m back from vacation. It was a great time of relaxing on the beach, reading in the sunshine (and rain, sadly), spending time with my family and eating different foods. Ocean Isle Beach is a great place to do nothing. Speaking of nothing; during my reclining on the beach, I was reading a book about reducing workload. It was one of those books that works against my “grain”. I’m a workaholic. Not in the sense that I love to “work” but, I love to do the tasks that make up “work”. So I don’t consider work, work. Does that make sense? The book was written by someone who wants to live the “big life”, have many nice things and… do nothing… but travel, enjoy life and look down on all the people who are strapped to their desks. In my perspective, he has a narcissistic, materialistic, lazy attitude. Sometimes, it’s books like these that make me think differently though. They make me “hear the other side”. This blog is about something that made me think. From “The 4 hour work week” book. Have you ever had something that is really important that has to be done? And you find yourself cleaning your desk, checking Facebook or twitter, doing unimportant tasks, checking your email, etc., instead of diving into the key thing you need to get done? I hope it happens to you as much as it does for me! 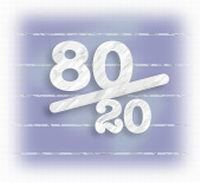 We’ve all heard the 80/20 rule haven’t we? You know, how that 80% of the work is done by 20% of the people. I think it’s called the Pareto Principle. What if that rule is accurate with our work? That 80% of our work is created to avoid the 20% of essential work! Ouch — that means that we probably are working harder, not smarter. I’m going to determine what is essential and important. Can’t figure it out? What if the doctor told you that because of a serious health issue, you could only work 2 hours a day. What would you have to drop in order to complete your job? What’s left is the essential. I’m going to attempt to do the essential things, the key things that I’m responsible for, first. I’m going to discover how much time is left each day to do proactive things. Self-improvement. Helping others with reaching their goals. Spending time with the family or church. Are you in it with me? Let me know how it goes for you! I’m actually excited to be heading back into the office!